In a previous Clinical Tip, we discussed the role of the Triple Burner as the avenues of fluids, a view deriving primarily from the Nei Jing. Also, in the previous Clinical Tip, we discussed that of the Triple Burner as the agent of the Yuan Qi, a view deriving primarily from the Nan Jing. We shall now discuss the view of the Triple Burner in relation to the movement of Qi. 1) It stems from the Yuan Qi (discussed in the August Clinical Tip). 2) It governs all Qi of the body (we shall see how below). 3) The Triple Burner has “a name but no form”, i.e. it is not an actual organ but a function. 4) It pertains to the Shao Yang with the Gall-Bladder. 5) It is a Fu. 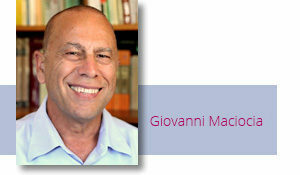 Let us explore now the meaning of the Triple Burner governing the movement of Qi. The movement of Qi in general is called the “Qi Mechanism” (Qi Ji 气 机). This Qi Mechanism consists in the ascending/descending and entering/exiting of Qi in different places and different organs. Each organ has a particular direction of flow of Qi, e.g. Spleen-Qi ascends while Stomach-Qi descends. In each channel, Qi flows in an upward or downward direction. As acupuncturists, we are very familiar with the ascending/descending movement of Qi.We use this movement every time we insert a distal and a local point to treat a particular problem along a channel. For example, when we use L.I.-1 Shangyang (for example) and L.I.-15 Jianyu to treat a pain in the area of the acromio-clavicular articulation of the shoulder, we are making use of the ascending/descending movement of Qi along the Large Intestine channel. By stimulating the ascending/descending movement of Qi in the channel, we are removing the obstruction and therefore the pain. We are somewhat less familiar with the “horizontal” movement of Qi, i.e. entering and exiting of Qi. Qi enters and exits in and out of various structures and organs. For example, Qi enters and exits the space between skin and muscles, the Membranes, the joint capsules, and all other cavities. Moreover, Qi “enters and exits” in every part of the body among the Tai Yang, Shao Yang and Yang Ming and among the Tai Yin, Jue Yin and Shao Yin. Take the shoulder as an example. 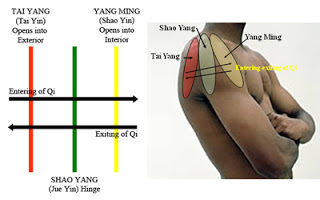 On the scapula we have Tai Yang (Small Intestine channel), on the lateral side of the arm we have the Shao Yang (Triple Burner channel) and further forward the Yang Ming (Large Intestine channel). Within this zone of the body, the Tai Yang area is on the most Yang area (the scapula), the Yang Ming on the most Yin area (because it is near the Lung channel) and the Shao Yang in the middle: this ties in with the view that the Tai Yang “opens onto the Exterior”, the Yang Ming “opens onto the Interior” and the Shao Yang is “the hinge”. Exactly the same reationship exists in the Yin between Tai Yin (most exterior of the Yin), Jue Yin (the hinge) and Shao Yin (most interior of the Yin). Notice how it recommends the use of points in the front and the back for each area: in the chest, use the front of the chest and Back-Shu points; in the abdomen Back-Shu points and Chong Mai points; in the legs, ST-30 (front of leg) and BL-57 (back of leg). This suggests a “horizontal” movement of Qi within each area.The Triple Burner controls the ascending/descending and entering/exiting of Qi in the Qi Mechanism. One of the words most frequently used in Chinese books to describe this function of the Triple Burner is tong 通 which means “free passage”, “to pass through”, “penetrate”: this describes the function of the Triple Burner in ensuring that Qi passes through in the Qi Mechanism, in all the cavities and in all organs. Chapter 38 of the Nan Jing also confirms that the Triple Burner exerts its influence on all types of Qi: “The Triple Burner stems from the Yuan Qi: it supports all of the Qi.”6 Chapter 31 confirms the influence of the Triple Burner on the movement of Qi in all parts of the body: “The Qi of the Triple Burner gathers in the avenues of Qi [Qi Jie]”.7 This means that the Triple Burner is responsible for the free passage of Qi in all channels but also all structures (such as cavities) of the body.Thus, the Triple Burner’s function in governing the movement of Qi is quite similar to the Liver’s free flow of Qi and indeed, there are many similarities. 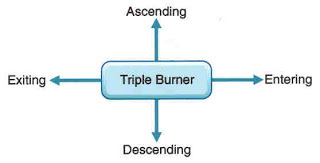 With regard to the movement of Qi, it is useful to compare and contrast this function of the Triple Burner with those of Liver in ensuring the free flow of Qi.The Liver ensures the free flow of Qi and this aids the ascending and descending of Qi in all organs, and especially in the Stomach, Spleen and Intestines: the Triple Burner’s influence on the ascending/descending and entering/exiting of Qi extends to all organs. Moreover, the Triple Burner controls the entering and exiting of Qi in all parts of the body and especially the body cavities: the Liver has no such function in relation to the body cavities. As the Triple Burner controls the movement of Qi in the Qi Mechanism. Its points may be used in a similar way to the Liver points to ensure the free flow of Qi. The main point I use to move Qi in the Triple Burner is TB-6 Zhigou. 1. Nanjing College of Traditional Chinese Medicine 1979 A Revised Explanation of the Classic of Difficulties (Nan Jing Jiao Shi). People’s Health Publishing House, Beijing, first published c. AD 100, p. 94. 2. 1981 Spiritual Axis (Ling Shu Jing). People’s Health Publishing House, Beijing, first published c. 100 BC, p. 111. 3. Hua Tuo 1985 Classic of the Central Scripture (Zhong Zang Jing), Jiangsu Science Publishing House, Nanjing, p. 39. Written in Han dynasty. 4. Classic of Difficulties, p. 144. 6. Classic of Difficulties., p. 94.7. Ibid., p. 80.